Complimenting the fall exhibition Waxing Poetic, the Pelham Art Center is offering a FREE Workshop and Demo focusing on encaustics, how to usethem and various techniques. R&F mixed media demos are designed to give interested artists a brief taste of what’s possible when using R&F’s two distinct paint lines: classic wax-based encaustic paint and linseed oil-based Pigment Sticks®. Both traditional and alternative approaches with a focus on the variety of surface applications will be demoed and discussed. 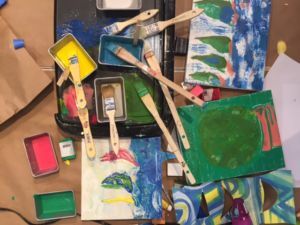 Topics covered will include: Equipment and tools, supports and grounds, layering and fusing methods, health and safety, surface effects, color line information, mono-printing, transfers, mark making, and collage.